You see, recreational marijuana isn't legal in New Jersey yet. But that could change soon. Governor Phil Murphy teamed up with leaders of the state Senate and House to work on a legalization bill. And last week, they announced in a press release that the broad strokes are settled. Right now, 10 states and Washington, D.C. allow recreational use of marijuana. An additional 23 states have approved its use for medical purposes. And more states are coming around. If the new legislation passes – and it seems likely to – New Jersey will become the fourth and southernmost state on the East Coast to legalize cannabis. The entire West Coast, including Alaska, has already legalized it for recreational and medical adult-use at this point. I believe that this legislation will establish an industry that brings fairness and economic opportunity to all of our communities, while promoting public safety by ensuring a safe product. But regardless of personal opinions on marijuana use and regulation, one thing is certain. Based on the details we have now, New Jersey municipalities with a cannabis wholesaler in their jurisdiction would receive a 1% tax on the product. Those that are home to a retailer would receive revenue from a 3% tax. If that doesn't sound like much at first, let's consider the states that are already profiting from legalization. Colorado and Washington were the first two states to legalize recreational marijuana. As a result, they collected taxes and fees totaling nearly $250 million and $320 million, respectively, in 2017. Meanwhile, Michigan is taxing recreational cannabis at a whopping 10% rate. The substance was just legalized there in December, so it's still early – but the state estimates the tax revenue alone will bring in $738 million over the next four years. Nationwide, the economic impact could be massive. According to New Frontier Data – an independent analytics company specializing in the cannabis market – if cannabis were legal for adult use in all 50 states, the industry could bring in nearly $132 billion in federal taxes by 2025. Not only that, but it could add more than 1 million jobs. That's an attractive potential outcome – too attractive for the federal government to ignore for much longer. Cannabis is proving to be a huge potential source of revenue for state governments across the country. At this point, full legalization in the U.S. is only a matter of time. We can't know if it will happen this year. But we do know it's coming. And in the meantime, these companies are maturing and turning into "real" businesses that the government – and Wall Street – can get its head around. The states are giving those businesses a chance to show what they can do. That means as we enter 2019, we're about to get more chances to separate the companies with solid business plans and strategies from the mere "fad" stocks of the day. This year will likely be a tipping point for cannabis investments. Make sure you're paying attention... The best opportunities could be taking shape right now. Editor's note: The cannabis industry's first legitimate investment opportunities are starting to appear... And they could see tremendous growth over the next several years. That's why Stansberry Research is holding its first-ever Cannabis Investing Event on Wednesday, March 27, at 8 p.m. Eastern time. To tune in and find out where this new market is headed, reserve your spot for free right here. "While you shouldn't fall for the hype in certain cannabis investments... that doesn't mean you should avoid this up-and-coming sector," Dr. David Eifrig says. Get his take on why now is the right time to invest in cannabis here: It's Finally Time to Get Into One of This Year's Hottest Industries. "The Fed is out with a new policy," Scott writes. "Importantly, this latest change is good news for the market... And the big winner should be this one sector." Learn more about another corner of the market where he sees opportunity right here. Ulta Beauty (ULTA) is a $20 billion cosmetics and beauty chain. Its nearly 1,200 stores offer makeup, perfume, and skincare and haircare products… spanning from affordable basics to high-end luxury brands. That includes exclusive lines you can’t buy from anyone else. 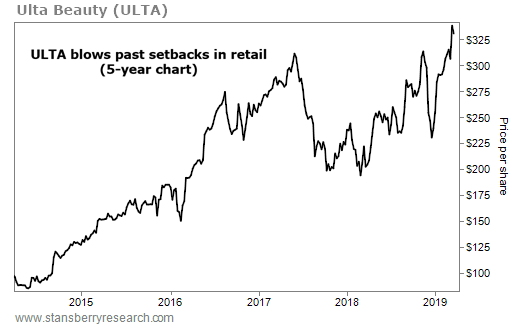 Ulta has also rapidly grown its online sales platform – e-commerce comparable sales rose 35% in 2018. Overall, the company’s sales grew 14% to $6.7 billion last year.